Nobel-winning economist Shiller: Cut of Mortgage Interest Deduction won’t affect housing market. In 1984, President Reagan declared that simplifying the tax code was a priority. Only one part of the code was untouchable: The mortgage-interest deduction, or MID. Reagan instructed the Treasury Department to “preserve that part of the American dream which the home mortgage interest deduction symbolizes.” When it came to tax law change, the MID, established in 1913, was a sacred cow. And it has continued to be to this day. That’s why when the House Republicans released their long-awaited tax proposal on November 2, it was surprising and controversial that the plan proposed cutting the mortgage-interest deduction. The draft bill would cut the MID sacred cow in two ways: It would double the standard deduction, limiting the motivation to itemize for homeowners of modest means. At the same time, the cap on qualifying mortgages would drop from $1 million to $500,000, effectively eliminating the MID for most wealthy homeowners. Owners of expensive homes would still be able to take the deduction on their first $500,000 of mortgage debt. If you have a $550,000 mortgage, for instance, you’d be able to deduct the interest on all but the last $50,000 of principal owed. Under the proposal, only mortgages on purchases made after the law is in force would apply. Predictably, realtors and home builders’ groups slammed the proposal, calling it an unacceptable tax hike on middle class families living in expensive areas, like D.C. and San Francisco. “The nation’s 1.3 million Realtors cannot support a bill that takes home ownership off the table for millions of middle-class families,” said William Brown, president of the National Association of Realtors, in a statement. Shiller famously predicted two of the biggest bubbles of all time: the dot-com bubble and the housing bubble. Both times, he published an edition of his book Irrational Exuberance, which described and predicted each respective bubble. Source: Robert Shiller. Heavy solid line (left scale): real (inflation-corrected) home price index, 1890 = 100. 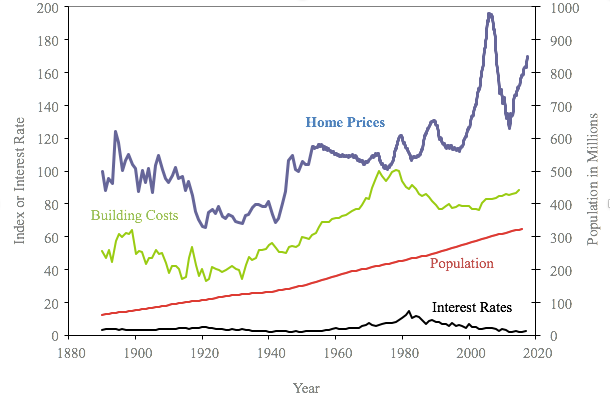 Thin line (left scale): real building cost index, 1979 = 100. Thin line (right scale): U.S. population in millions. Lowest thin line: long-term interest rates. And according to Shiller, the forces driving real estate appreciation have little to do with MID. In an interview with CNBC, Shiller noted that: “Most homeowners don’t claim the deduction and instead use the standard deduction.” He believes lowering the cap would have more of a minor psychological effect on home prices than a calculated one. According to Shiller, the factors driving the real estate market are mainly behavioral — and that the interest rate deduction, which is limited to a small subset of homeowners, is insignificant in comparison. He believes that most people don’t base home ownership on tax-savings calculations — there are “bigger things” driving their decisions. Home buyers view home ownership as a secure way to build wealth, and recent housing gains have only reinforced this belief.The MID is mostly symbolic, he argues. “It is part of American culture. It goes back to the American dream,” Shiller said. “It stands for something — the government is behind the homeowner.” Still, in the big picture of the housing market, Shiller sees cutting the MID as a non-event. But many in the real estate industry continue to view the mortgage interest rate deduction as untouchable. About 64% of Americans own a house. Roughly two-thirds of those homeowners have a mortgage. Only 6% of all mortgages are for $500,000 or more. Fact is that the proposed cuts in the MID would affect only about 2.5% of American households. In addition, current homeowners would not be affected by the changes, further lessening their impact. Housing investors appreciate any tax savings they can get. But the housing market does not depend on tax breaks. Housing is driven by jobs, income, and as Robert Shiller points out, Americans’ confidence in the economic future. The real estate industry may cry foul over changes to the MID, but should the cuts become law, the housing market hopefully won’t skip a beat.